Items 141- out of displayed. At the end of each year we usually look back and check how markets were trading and how our predictions played out. We again did a pretty good job which gives us even more confidence for 2016 as Elliott Wave theory over and over again proves to be one of the best tool for analysing the markets. We are not analysing markets only for ourselves, we want you to be part of market trends as well, and be on the right side of direction. That said we decided to release Yearly Membership Offer once again and give you an opportunity to join our community for much lower price. 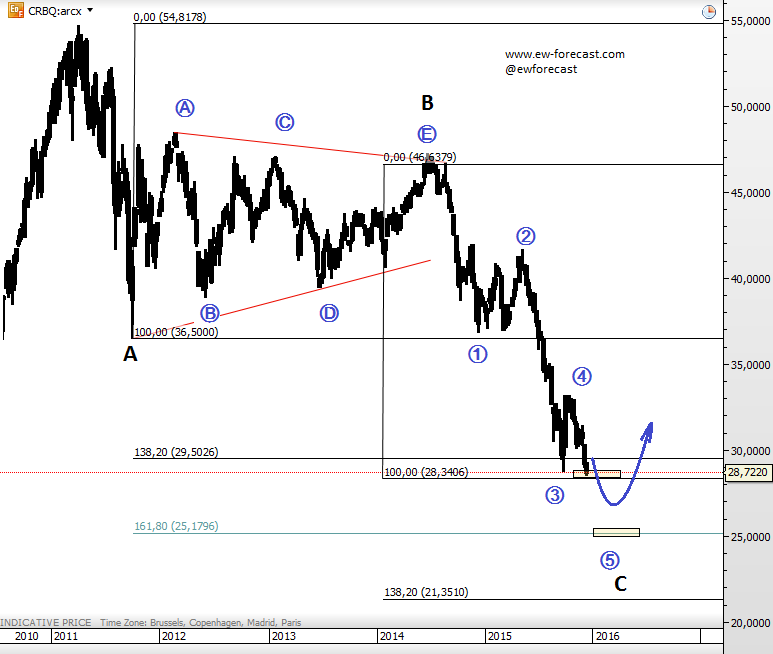 Below you can find some flashback charts on EURUSD, AUDSD, GOLD, CRUDE and S&P500. 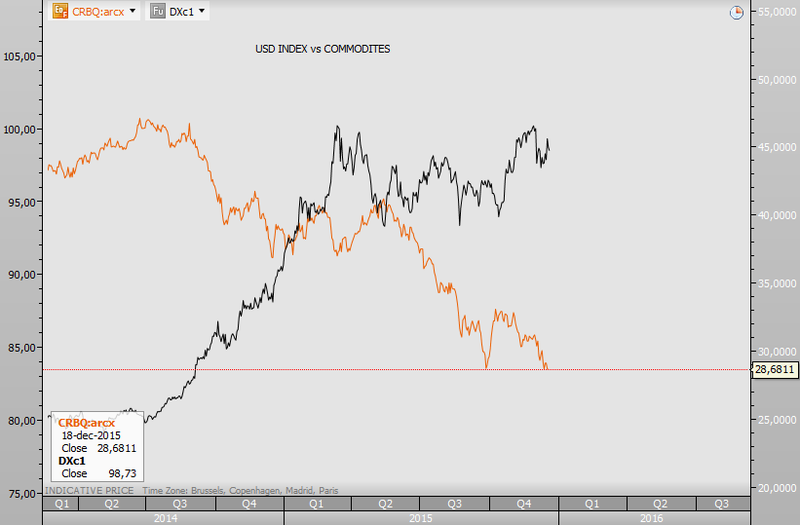 In this article we will look at CRB Commodity Index. This is important market to track for overall direction on commodities. What we see on the weekly chart below is a five wave of decline within wave C which means that current weakness can be coming to an end. Ideally market will turn up in 2016, but it can happen from around 28,00 or from next Fibo support at 25.00. if we are on the right track then grains, as well as oil and even gold can turn up as next year while USD trend may slow down because of negative correlation. Crude Oil fell down to our $35 target and nearly 50 cents lower before market bounced higher two days back. We see a nice spike at the low that suggests bottom in place. In fact, a divergence and five subwaves within red wave v) also suggests that market should recover in minimum three waves. Ideally price is now in wave (iv) that can be headed back to around $40.40 where former swing low can turn into a resistance. So for now, we are turning bullish for an a)-b)-c) bounce. 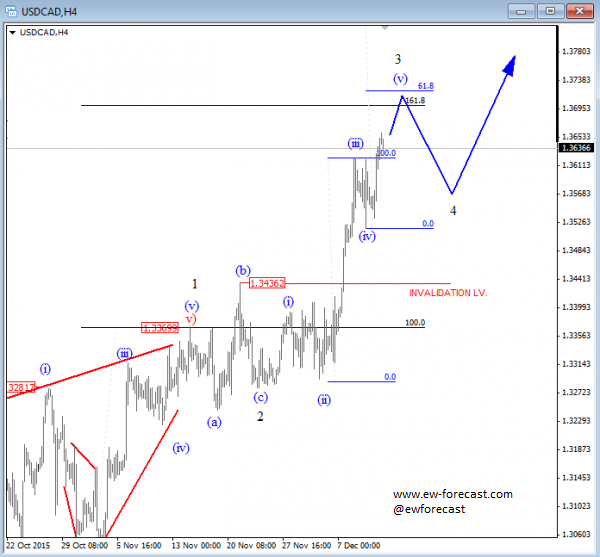 USDCAD is at new highs once again as expected, following recent pullback to 1.3515 that we labeled it as wave (iv). This was just a minor correction within extended and sharp wave 3 that can be targeting 1.3700 area where gains may slow down. Ideally pair will turn into a new correction next; wave 4 of a higher degree. 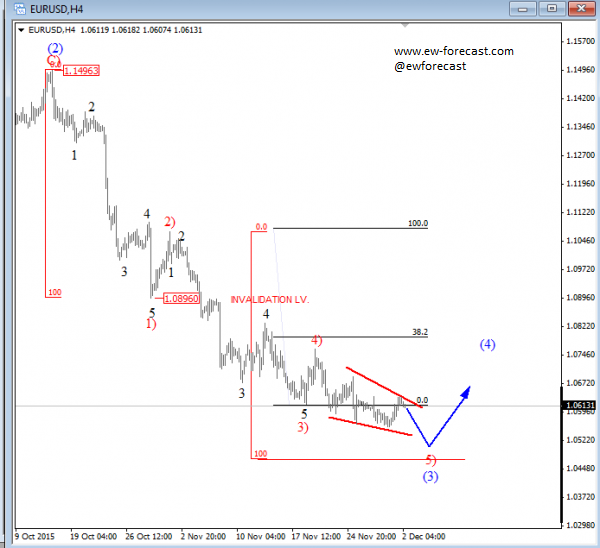 EURUSD turned sharply up from the low yesterday after the ECB press conference, but this move has been technically expected even ahead of the ECB decisions as we identified an ending diagonal in wave 5) of (3). We know that ending diagonal usually causes a sharp and aggressive turning point so current move up is not a surprise. We see leg up as wave A), part of a minimum three wave rally in wave (4) that can reach even 1.1070 this month. However, in the next few days we may see a retracement down in wave B) back to around 1.0760; potential support. Nothing moves in straight line. 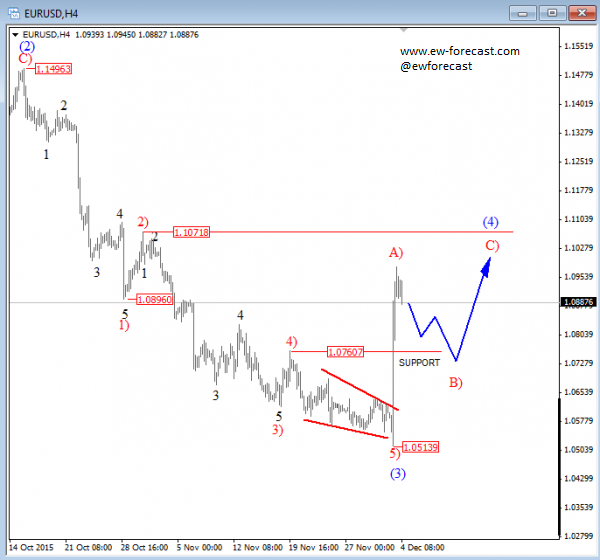 EURUSD is at the lows but it's moving very slowly so we think that price is in wave 5) of an extended blue wave (3). However, there is room for a move down to 1.0480-1.0500 area before we may see a bounce. 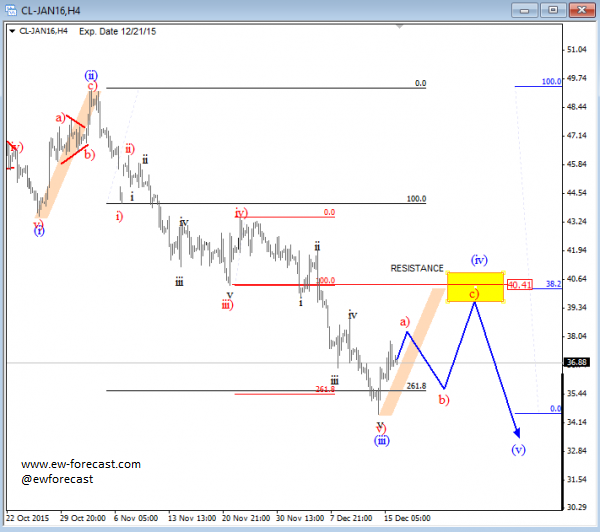 Ideally market will recover at the start of December with three waves if we consider that wave 5) can be now an ending diagonal which suggests that current bearish leg is nearing a completion. S&P500 is trading sharply higher following a bounce from 1997 on Monday where we labeled end of a three wave decline. 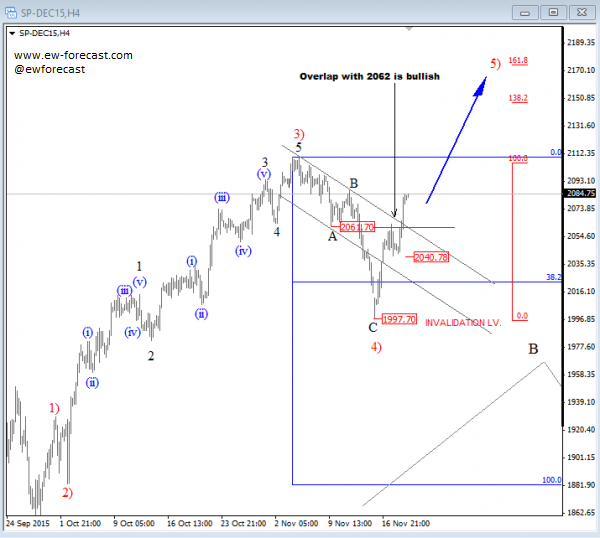 It was a corrective move in wave 4) that sent price up into wave 5) which will be targeting new highs. Notice that upper trendline of a downward channel is broken so more gains should follow in days ahead. High of 2112 can be taken out soon which will lead to more gains; up to 2150-2170.